Baked goods are always a little risky for me – cookies especially, which is tragic because I love them SO MUCH – which is why I usually stick to tried and true cookbooks. (See, e.g., Kelly Peloza’s The Vegan Cookie Connoisseur, which I really should review one of these years.) But the Snowball Cookies in Vegan Holiday Cooking looked so tempting that I just couldn’t help myself. Caution, meet wind. The results are a little mixed. 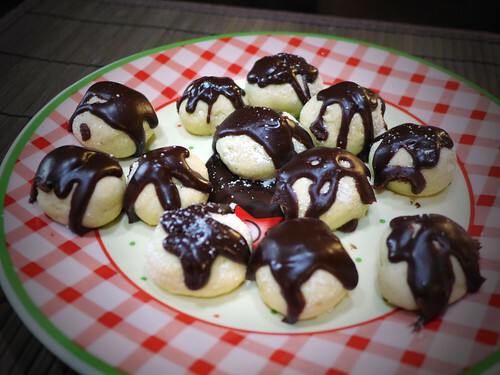 While the cookies themselves are pretty easy to make and taste amazing, the chocolate icing (? ganache? glaze?) proved a bit of a mess. It was thin and runny and didn’t set on the cookies AT ALL, even after fifteen minutes in the fridge. Plus the recipe made at least three times more chocolate than was necessary, and now I’m stuck with an entire pint of extra chocolate sauce. Not the worst problem, but still. In the end I added about 1/4 cup of cornstarch to thick the sauce up; while it still transformed the cookies into a sticky mess, it was much more manageable (and tastier) than the previous wet mess that was the test cookie. Next time I’ll probably just skip the recommended sauce altogether and use a magic chocolate shell or some kind of chocolate (or not! the eggnog flavor from The Vegan Cookie Connoisseur would go great on snowballs!) icing instead. This entry was posted on Tuesday, December 9th, 2014 at 1:10 pm. You can follow any responses to this entry through the RSS 2.0 feed. You can leave a response, or trackback from your own site.